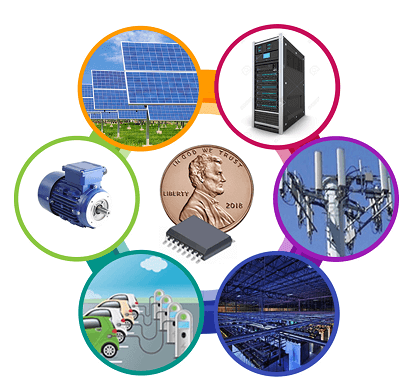 Power architects are continually asked to push the boundaries for system efficiency, response time, small size, and low cost in new power system designs. Most modern designs require current sensors to help implement the complicated control, telemetry, and protection circuitry essential in meeting these difficult design goals. Often, choosing the right current sensor plays key part in achieving these goals, especially when higher voltages, higher power levels and difficult ambient conditions come into play. Aceinna’s new family of MCx1101 AMR current sensor ICs now provide design engineers with a compelling alternative for new system designs by offering benchmark performance for accuracy, high bandwidth with low phase delay and response time all integrated within an easy-to-use, cost effective, single component solution. The MCx1101 is an ideal match for many challenging power applications including motor control, inverters, uninterruptible power supplies (UPS), and industrial power systems as well as AC-DC and DC-DC power systems used in the telecom and high performance computing (HPC) markets. The MCR1101-20-5 is part of Aceinna’s new generation of fully integrated, isolated, current sensor ICs that provide industry benchmark performance for accuracy, bandwidth, and step response time. With total error as low as 0.6% (typ), 3dB bandwidth of 1.5MHz with low phase delay, and <300ns transient response, the MC1101R-20-5 provides power designers with an ideal current sensing solution for the critical electronic circuits that provide control, protection, or telemetry in many of today’s demanding power conversion applications. The MCR1101-20-5 has 4.8kV of isolation (supports working voltages up to 1097Vrm) and provides a ratio-metric output with a 5V supply voltage. Copyright©️2019. Aceinna All Rights Reserved.